As a Visitor Services Assistant, I always try to be as informed as possible about every new exhibition. I mistakenly think I‘ve got a solid idea of the new displays, but then I somehow always attract visitors who ask the most obscure questions, that I have no idea how to answer! So, I’ve had to look beyond the immediate sources of information that we are given in curatorial interpretations, artist’s statements and stagnant wall panels. These are normally full of the cold, hard, academic facts which just don’t hit the mark with the visitors I speak to. Instead, I’ve found people are more inclined to engage with the human stories, something relateable which can generate emotional affiliations. This is where I’ve turned to books, with more insightful details and less academic language to excite the imagination. Good old- fashioned books, directly and indirectly relating to art can enable us to envisage stories with more background information. The literature provides understandings of different characters voices and individual experiences; isn’t this something paintings have always attempted to convey? Therefore art and books work symbiotically. There are so many varying books which contextualise the art in our gallery, especially fiction which I’ve found much easier to absorb; delving deeper into the wider social, political and personal perspectives. These are all aspects which present a more human translation of the art world with tangible atmosphere. "Fiction, novels especially, are very influential on the way I curate.... So long as you have a few 'facts' up your sleeve, it's much better to love reading a great novel than it is to slog laboriously through a dry history book (please note, I am in no way saying all are dry), if you're trying to flesh out a historical period in your own mind." - Hannah Williamson, Curator of Fine Art. Book: Rodin’s Lover by Heather Webb Amazon.co.uk- a peak into the private life of Rodin, his lover and their collaborative art works. Art: Painting Light and Hope (DATE) Annie Swynnerton ©Manchester City Galleries // currently on display. 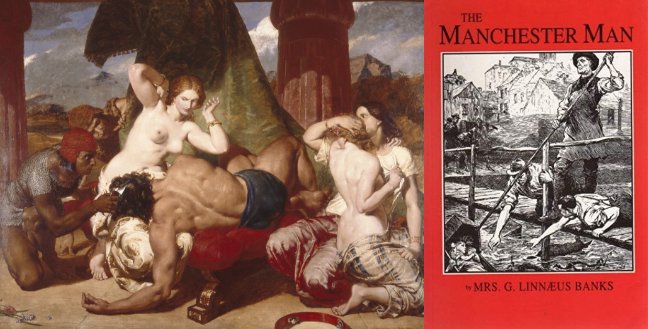 Art: Samson Betrayed (1850) Frederick Richard Pickersgill ©Manchester City Galleries // currently on display. Book: The Manchester Man by Mrs G.L. Banks - follows the life of a Manchester resident for an idea of the sort of characters who collected many of the paintings we have on display. Also useful for talking about Manchester’s history. Art: The Dinner Hour, Wigan (1874) Eyre Crowe ©Manchester City Galleries // currently on display. Book: North and South by Elizabeth Gaskell ©Amazon.com.- this follows the story of a girl who moves from a quaint southern village to an industrial Northern town near Manchester, a social novel revealing the conditions of the working class in contrast to the treatment of the mill owners. Art: Sir Walter Scott (after 1830) John Watson Gordon ©Manchester City Galleries // currently on display. Book: Waverley by Sir Walter Scott ©Waterstones.com - for a sense of Victorian Scottish-ness. Art: Astarte Syriaca (1877) Dante Gabriel Rosetti ©Manchester City Galleries // currently on display. Book: Desperate Romantics by Franny Moyle ©Waterstones.com- could be easily mistaken for a novel rather than a detailed history of the Pre-Raphealite's private lives, with context for each work we have on display (including the juicy bits). Art: Two Figures: What Maisie Knew (Formerly called Hubby and Marie) (1914) Walter Sickert ©Manchester City Galleries // currently on display. Book: Walter Sickert A Life by Matthew Stergis ©Amazon.co.uk- for an idea of how the different artists in our collection were connected through artistic circles such as the Camden Town Group and the London Impressionists, plus the significance of Sickert's paintings that we display. Art: Henrietta Moraes on a Blue Couch (1965) Francis Bacon // currently on display. Book:Francis Bacon in your Blood by Michael Peppiatt ©Amazon.co.uk - written by Bacon's close friend, an account of the artist's life and work. Art: Still from Crop Over (2007) Sonia Boyce ©Manchestern City Galleries // currently on display. Book: British Black Art: Debates on Western Art History by Sophie Orlando ©Amazon.com // currently on sale in our gallery shop- for fresh narratives on the works that have been excluded from canonical Art History, a good one for feminist interpretation and cultural politics. Art: PH Artichoke (1958) designed by Poul Henningsen, made by Louis Poulson // currently on display. Book: The Idea of North by Peter Davidson // currently on sale in our gallery shop- this is a study about how ideas of 'the north' have found expression, including chapters on 'Treasures and Marvels of the North'. There will be more book lists to follow, so keep a look out and let us know if you have any recommendations in the comments below!